Why do all societies we know of practice some form of religion? Either religion must be “true”, or there must be some sort of natural explanation for this universal phenomenon. 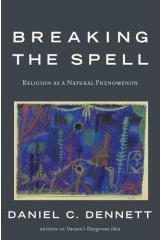 “Breaking the Spell” by Daniel Dennett presents avenues of research into these explanation. He does not profess to have the answers to this question, or even the right question. He merely sets out to prove that the questions are important ones and ones that we can hope to gain insight into. This story undersells Dennett and his books, of course. I have been a fan of Dan Dennett for over ten years. His accessible books “Darwin’s Dangerous Idea” and “Consciousness Explained” have radically shaped my understanding of evolution and the brain. “Breaking the Spell” does the same with religion. So, if religion has a natural explanation, what could this explanation be? Obviously, something in our evolutionary history has made us religious. Does this mean that religion is good for us, or rather, that it helped our ancestors survive? Not necessarily. Dennett shows how certain traits that could’ve been good for us, like susceptibility to the placebo effect and a disposition to interpret events to be caused by an actor, could’ve made the human mind susceptible to other ideas, or memes as well. As long as these ideas don’t cause the “host” fatal damage and they can spread to other “hosts”, such ideas would become widespread, even if they were (moderately) harmful to those who bear them. The question for the final part of the book, then, is what effect religion has on it’s adherents and society at large. When does it help us and when does it harm us? Dennett suggests experiments that could further explore this subject, but doesn’t offer definite evidence for any hypothesis. The weakness of the book is that it spends quite a bit of time excusing itself to hypothetical fundamentalist readers. Even if you believe your religion is true, Dennett points out, you must wonder where all the other religions came from. Even if you believe your religion is true, you must wonder what effect other religions have on society. I wish the book had spent more time exploring the issue at hand (why religion might exist, what effect it has) and less time excusing the validity of the question. But it’s an enjoyable read and gave plenty of food for thought. Dennett remains my favorite philosopher author. Dan Dennett: A secular, scientific rebuttal to Rick Warren: Dennett gives the superstar pastor of the Saddleback (no, that’s not a code word for something dirty) church a good spanking. This entry was posted in Books, English, Non-technical. Bookmark the permalink. Personally, I'm interested in how this relates to the domain we work in. How does the belief in belief affect the sw industry. There are plenty of examples of industry trends that are driven forward (and backward) based on belief rather than objective or justified analysis. How can this belief in belief be overcome? That is a very interesting idea. I guess the analogy would be if we though that it was unknowable if XP, Scrum or OpenUP or whatever gave us benefit, but we still think it's useful to have a methodology in order to have a direction. Similarly, we could think that if we choose SOA or REST or DDD that won't make a big difference. But choosing one architecture will give us a common purpose. Is this what you had in mind? Is this “belief in belief” prevalent? I hadn't thought about that angle so much – but I think its a good one. Originally I was more concerned with getting people to be aware of their innate wiring to attach themselves to a “belief” regardless of its rational justification. There's plenty of religious battles in IT including all the buzzwords you mentioned. If people are aware of their tendencies then they can be better at overcoming them. However, I think your angle is a more positive way of applying his thesis to sw dev. Taking advantage of peoples' belief wiring to get them to approach things from a similar perspective. I guess the hard part is getting them all to change direction if you figure out that its not the correct approach for a particular problem. I think we might often be saying “we have to agree on something (e.g. SOA or Agile), even if it doesn't work”. This is close to believing in belief. But I don't think that holds water. Our ideas need to pull their own weight. Otherwise, they will get in the way of what really does work.